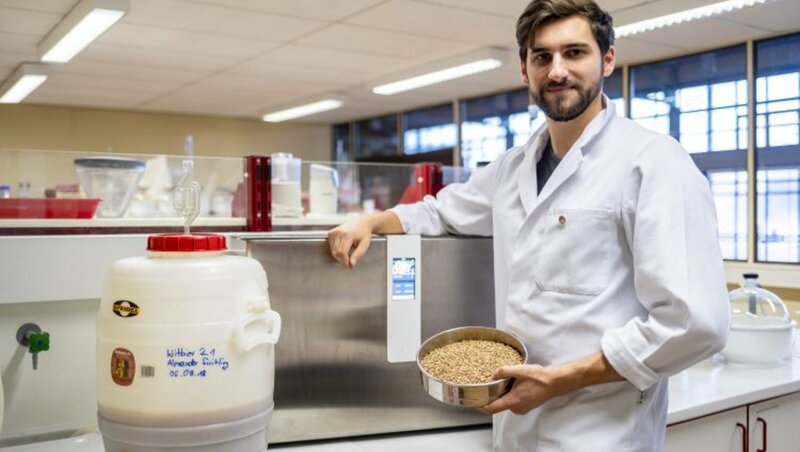 When Alexander Switling talks about his part-time job at Anhalt University of Applied Sciences, other students ask jealously: "Wow, you can brew your own beer and even get money for that?" But it was not him looking for work that has helped the student of Food Technology to get this job. Instead it was his voluntary commitment in the university's own experimental brewery in Köthen that did not go unnoticed. There, Alexander liked to work, test and brew beyond the study framework and was therefore able to create his first own beer. But where does the strong interest come from? "Professor Jean Titze inspired me in his lecture on food technology of herbal products“, says Alexander Switling with a smile. In the university brewery, the 24-year-old then gave attention to the equipment of laboratory and technology for the first time. The high proportion of practice in the study program is common and suited him very well. In addition, Alexander helped beyond the given workload and also devoted himself to the production of a beer in his project work. He enjoys the freedom to work independently and develop recipes from hops and malt. And if necessary, Professor Titze will assist him as a guide. To top it all off the budding food technologist took part in a brewing competition in Stralsund. Unfortunately, the young brewer did not win a prize, but the participation alone rewarded the student for the exhausting first semester of his studies and the possibilities shown. With the help of the university his vocation crystallizes more and more. He sees his graduation as a "future-proof investment" and has precise wishes for starting his career: "Preferably in a brewery!"